As many readers would probably know by now, Mark isn’t the world’s biggest fan of Will Ferrell. Thus it was probably for the best that I covered Blades of Glory for hoopla.nu. This latest flimsy-yet-mildly-amusing-premise puts Ferrell and Jon Heder in the limelight as rival figure skaters forced to become the world’s first men’s pair. The opening scenes are fantastic, as we see Chazz Michael Michaels (Ferrell) and Jimmy MacElroy (Heder) strut their stuff on the ice. Their routines are hilarious and both are clearly in their element. The film lets us down soon after, however, when the two are required to team up. Funny as Ferrell and Heder can be, their performances simply don’t bounce off each other. It’s almost as if their (admittedly brilliant) characterisations exist in a vacuum. Their bickering is simply disappointing, when it should have been the best part of the film. In comparison, the supporting cast is perfect. Real-life couple Will Arnett and Amy Poehler shine in their scenes as the rival skating duo, twins Stranz and Fairchild Van Waldenberg, and this is precisely because each is sensitive to the other’s performance. The third Van Waldenberg (Jenna Fischer) does a great job as the love interest, as does Romany Malco as Jimmy and Chaz’s choreographer. The skating scenes are great. It’s apparent that all of the actors involved did at least some of their own skating, and when the special effects kick in they’re good enough for laughs. 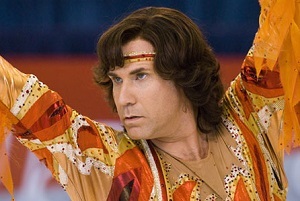 Generally speaking Blades of Glory is a solid if uninspiring comedy, generally amusing with patches of brilliance. Frustratingly, there are a couple of moments that should have been elaborated on but seem underdeveloped, maybe in the interests of a more ‘mainstream’ release. On the other hand, they bleed dry the idea that most men wouldn’t be comfortable sharing the ice with another man (whilst wearing spandex, to boot). Overall it seems to be the least ridiculous of Ferrell’s traditional comedies, and probably suffers a little as a consequence. Ferrell could keep making these movies til the sun explodes, and it can get a little tiresome to see one released every eight months or so. It was great to see him in Stranger Than Fiction, but hey – that film barely made a profit domestically. Blades of Glory almost doubled its budget in returns, so it’s easy to figure out what we’ll be seeing more of in the future.. This entry was posted in Film Reviews and tagged Comedy, Sports by Stuart Wilson. Bookmark the permalink.